Organic wines have been produced for centuries, but only recently have they become certified as organic. It’s often a confusing topic as many people do not know what goes into making an organic wine. There is also a huge debate as to the difference between a wine that is certified organic as opposed to one that just contains organic grapes. Any wine that claims to be organic must at minimum use grapes that have been grown organically. That means we are not drinking harmful chemicals along with our wine. Pretty straightforward, so whenever you see a wine that has organic grapes, you know that it was grown with you and the environment in mind. Here is where the debate gets interesting. A wine can say that it uses organic grapes but not be certified as an organic wine. Organic wines use organic grapes, but also do not contain any added sulfites in the wine. I emphasis the word added as the production of wine causes a natural formation of sulfites. Sulfites do occur naturally in winemaking, but many winemakers add it during the process to get a product that will last longer. They act as a preservative in order to prevent oxidation and produce a better end product. Doesn’t seem like a big deal, or is it? Many people have various problems when consuming products in which sulfites were added. The most common are difficulty of breathing and headaches. If you get bad headaches after drinking wines, this could be the reason. The next time you go to buy wine, be sure to check the labels appropriately. 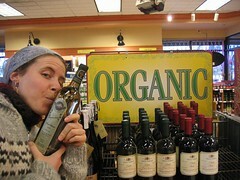 Some wines may display large text of organic, but may just use organic grapes. If you want to buy a truly organic wine, some cautious must be taken with foreign wines as some claim to be organic, but only use organic grapes. Also be sure to check into the vineyard and winemaker. There are still some vineyards that grown grapes organically or don’t add additional sulfites to their product and just don’t want to go through the process of getting certified organic. That’s interesting on the headaches, I guess that is why I sometimes get headaches after drinking wine. I wonder how bad Sulfite is for the Human, I bet it’s not that good considering it is a preservative… and I am not a fan of preservatives in products, which is why I tend to stay away from canned foods.